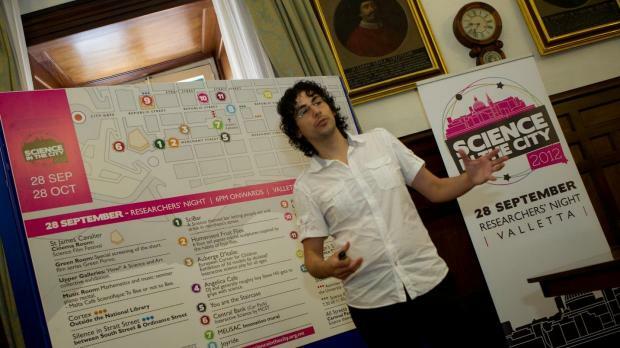 Edward Duca explains the programme of Science in the City. Science in the City - a series of science-related activities, will be held in Valletta in the evening of September 28 as part of the pan-European Researchers’ Night. The activities will take place in Valletta, from St. James Cavalier, through Merchants' Street, past St John’s Co-Cathedral, into Republic Street, St. George’s Square (Palace Square) and including the Chamber of Commerce. Professor Alex Felice said Science in the City will be the first science and art festival to be held in Malta. "We are inviting children, young people as well as adults to come to Valletta, meet scientists from the University of Malta as well as artists inspired by science, and participate in science-related activities in a fun and relaxed environment,” Prof Felice said. Wilfred Kenely, Chief Executive of the University’s Research Innovation and Development Trust, said this activity was an opportunity to promote the newly set up Research, Innovation and Development Trust (RIDT). Science in the City will feature over 20 events in 14 different venues in Valletta celebrating science in an enjoyable and relaxed way. The main activity will be a live science TV show at St George’s Square, hosted by Pawlu Borg Bonaci, revealing researchers, live experiments, and packed with entertainment for all the family. At St. James Cavalier Centre for Creativity, there will be a collective exhibition by Maltese artists called 'How? ', a science film festival, Malta Café Scientifique talk, and a piano recital. St James Cavalier will be transformed into a science discovery centre until 28 October 2012. At Palazzo Ferreria, the Malta Association for Contemporary Music is coordinating a 20 minute performance (repeated at 8pm, 9pm and 10.30pm) featuring flute and live electronics by musicians from the Music Conservatory of Venice. Some witty science-based street art and installations will be reaching out to pedestrians along Merchant Street and Republic Street. These include 'Joyride' by Emmanuel Bonnici, six-foot high ‘Humanised Fruit Flies’ by Liliana Fleri Soler, a sculpture inspired by DNA called ‘You are the staircase’ by Norbert Francis Attard, and a hanging sculpture 'Cortex' by Raphael Vella. In Strait Street, Chris Briffa will be installing an echo free room, an experience not to be missed. At the King’s Own Band Club, visitors will have a chance to meet scientists and discuss research over a drink. MEUSAC and the Auberge d’Italie are hosting an EU Corner with shows and fun activities for children. MCST is holding interactive science exhibits and live science shows with experiments at the Central Bank car park area. Families will also be treated to a science-themed carnival parade ‘Maskri Grotteski’ along Valletta main streets, while various university student groups will give fun science demonstrations for all to enjoy.